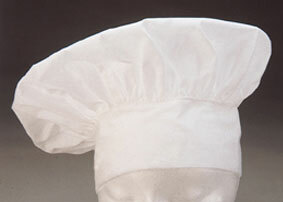 Kitchen Supply professional?quality white chef's hat makes you the top chef in your kitchen. Crisp, white twill fabric of cotton/poly with wide band adjusts to fit all sizes. Machine wash, warm; tumble dry, low. Overall:.